It’s that time again. I’m joining Terry Spear for another Facebook party, to celebrate the publication of her paranormal romance – it’s a wolf shifter book. So, we’ll be talking about shifter heroes, and paranormal romance, and wolves vs. dragons. There will be doorprizes and it’ll be a lot of fun. Terry will be celebrating all day, but I’ll be there at 7PM Eastern. Here’s the link. Come on over and say hello! It’s the middle of May, which seems like the perfect time to celebrate Thorolf’s day. I have lots of lovely reader swag for Serpent’s Kiss, prepared for conferences I’ll be attending. Not all of us get to conferences, though, so let’s celebrate Thorolf’s Day by giving away some goodies right here on the blog. • a pair of Thorolf earrings, custom-made by Aunt Matilda’s Jewelry. • a signed trade paperback copy of Serpent’s Kiss. All you have to do is comment on this post for a chance to win. Tell me why I should choose you. 🙂 (Remember that if you haven’t commented on my blog before, your comment will be queued for moderation. It’s not gone; just waiting.) As usual, this contest is open internationally. I’ll choose a winner in one week, on May 22. Thorolf’s book is on sale today! Remember that the digital edition of Serpent’s Kiss is discounted today and tomorrow only. Wednesday will be Thorolf’s day this week, the day that Serpent’s Kiss goes on sale. Because there aren’t pre-orders available at every portal, I thought I’d run down today’s plan for you all here. First, an aside. Many of the names for the days of the week in English come from the Norse pantheon. Wednesday actually derives from Odin’s Day, while Thursday derives from Thor’s Day and Friday from Freya’s Day. It’s kind of funny to have Thorolf’s day on Odin’s Day, but there you go. Serpent’s Kiss is already available for pre-order at All Romance eBooks, Apple and KOBO. The book will go live automatically on April 30. I’ll guess that the transition will happen at midnight Eastern time for KOBO (since they’re in Toronto) and midnight Pacific time for Apple (since they’re in California). I believe ARe is in the midwest, so it might be midnight Central time for that portal. We’ll see how it all shakes out. Serpent’s Kiss is loaded and ready to be published at B&N Nook, Amazon, and Createspace. I will publish at 6 PM Eastern at all three portals. The time it takes each portal to process the book will vary—I believe there’s also a variation based on volume at every portal. Amazon has been comparatively quick for me in the past year, so I’ll guess the book will be live for sale there between midnight and 2 AM Eastern. B&N varies wildly—it could be available around the same time as Amazon, or could take up to two days to process. They’ve been quicker this year, so fingers crossed. The print edition will be available for order as soon as I publish on Createspace, then its information will perk through to other portals. I expect it to be listed for sale on Amazon by the next morning. There’s no telling how long the print edition will take to be listed at B&N and other portals. 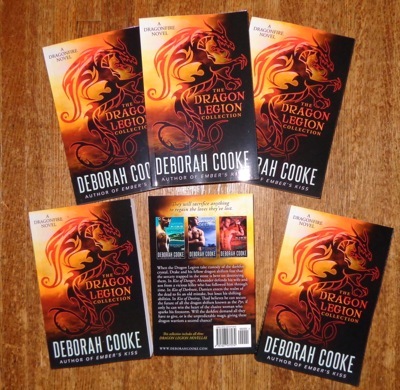 This is a trade paperback edition, the same size as The Dragon Legion Collection. The upload to Overdrive will be done later this week. Again, there’s a processing period, but I’d expect Serpent’s Kiss to be available from Overdrive by the middle of the month, and from the portals to which they feed content (like Waterstones) by the end of May. Let’s hope that more portals set up pre-order capabilities by the time The Frost Maiden’s Kiss is ready for publication. Remember that Serpent’s Kiss will be discounted from $6.99 US (or equivalent) to $4.99 US (or equivalent) for two days only – April 30 and May 1. That’s because not everyone could take advantage of the pre-order discount offered on Apple and Kobo. Once the Amazon and B&N links are live, I’ll send out my May newsletter (on the 30th of April!) There will be a special contest for subscribers in this issue, so if you haven’t signed up for it, please use the link in the right sidebar to do so. Well, there’s no doubt what this month’s prize book has to be, is there? 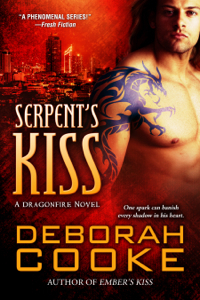 This month, one lucky reader will win a signed trade paperback copy of Serpent’s Kiss. All you have to do for a chance to win is comment on this post. As usual, this contest is open internationally, AND for every 25 entries, I’ll add another prize book. ETA – 62 entries means there were THREE prize books this month. Congrats to all the winners, and thanks to everyone who entered. This post is now closed to comments – but the May contest is posted.